The complete experìence of Dubrovnik is unthinkable wrthout enjoying authentic. traditional dishes prepared from thè oid recipes of our grandmothers from fresh ingredients from our clean sea and from thè flatlands near thè city, vvhich Dubrovnik's best chefs ennobte with their skill. Dubrovnik is not just walls and a thousandyear cultura! heritage. it is a!so thè unforgettable taste of daily fresh fsh. oysters, and other seafood, prosciutto that is dried in a traditional way. cheese in oil. young goat and lamb "uaaer a cooking lid," homemade olive oil and herbs for seasoniog. Dubrovnik is also a drop of travarica with thè aroma of fig and a glass of outstanding wine from thè Peljesac or Konavle vtneyards. A homemade meal of fish and fruits of thè sea, simply prepared in a way that emphasizes their unique tastes and freshnes, abundantly seasoned with homemade olive oil and aromatic herbs from thè surrounding hillsides, will provide an unforgettable gastronomie experience that you will remember long after you have left Dubrovnik. You will asso enjoy thè young lamb and goat raised on thè aromatic and healthy Mediterranean herbs and thè locally raised pig. And just as you are sampling thè sweet delicacies and locai te, figs. oranges, carob, loquat that flourish in Dubrovnik gardens, you will take away with you a part of this sunny Meditsrranean climate. And at thè end, as thè nectar of thè gods, comes thè unique taste of our rozalin; a homemade walnut-flavored orahovica; a liqueur of myrtle and aromatic loquat and on to thè traditional medicina travarica and wines from Peljesac, Korcula, and Konavle. Dubrovnik is proud of its rich gastronomie tradition that has been preserved in its daily banquet. It is our desire that during your visit to Dubrovnik you become ac-quainted with our traditional dishes and that you choose from thè menus of thè many restaurants, taverns, and wine cellars that which will constantly remind you of Dubrovnik. That is why we suggest that you treat yourself to some of thè "must-try" delicacies of thè Dubrovnik region. PROSCIUTTO AND CHEESE IN OIL This is thè combination of your dreams, either as an appetizer or just as an accompaniment to a glass of good locai red wine. With a few olives and homemade bread, it is certain to delight you. 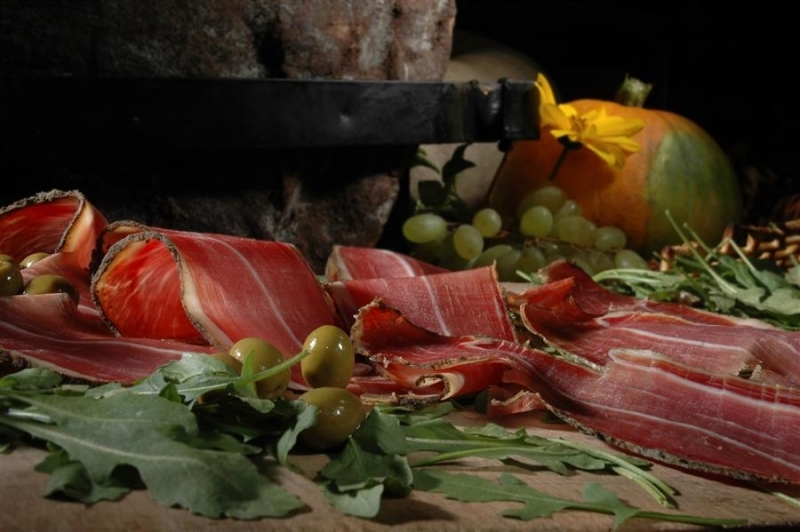 In thè Dubrovnik region prosciutto is traditionally prepared according to old recipes and is dried in thè bura, a strong wind from thè northwest. Cheese in oil is a typical traditional dish of thè Dubrovnik coastal area. It is a homemade cheese that is set aside cover in homemade olive oil, which gives thè cheese its distinctive aroma and tanginess. Grilled fish - thìs is thè primeval tasta of thè Meditarranean. It is a simple meal in which fresh -flsh, and only fish, has thè first and last word. It is ideai when thè fÌ5h te grilled on a bed of grape vines, basted with homemad olive oil and seasoned with rosemary. Go lo a restaurant, select a fresh fish from thè daily catch, soak in thè aroma while it cooks on thè grill, and at thè end enjoy il. And don't forget to wash it down with a glass of good reci wine. Brodetto - this dish, to which each part of thè ragion around Dubrovnik gives its own character, either in thè in-gredients or in thè manner of preparation, is a rhapsody of aromas and tastes. It is prepared from thè highest qualìty white fish from our sea (scorpionfish, grouper, dentex), but also from lobster, with thè addition of shellfish and shrìmp. It is seasoned with aromatic spices specific to this region, olive oil, wine, prosecco, a little vinegar. It is served with polenta. Salted pilchard and anchovies - you will find them in taverns and restaurants for guests who want to use this tangy snack as an accompaniment to a glass of good homemade wine. Swimming in olive oil, with some capers. they are an excellent snack. useholds in these regions. All of the and aromas of thisfine moni n.m;ed ori modiana! Mediterranean herbs of thè surrounding pkiins, wrvod kxjolhof wifh young potatoes and nerbai seasoning under a md hot cooking lid, will be released on your piati? and will givo yen i a unique gastronomie expenenoe. And don't forget to wash it ali down with good Croatian rod wine. The queen of al! rakijas that is distinguished by its medicinal charactenstics. Simply stated, it is a domestic rakìja with medicinal herbs. You will ask: Wfiich herbs? The answer is not so easy because there are as many recipes as there are people who make it. Up to ten types of domestic medicinal herbs and plants can go into it, but here are just a few of them: rosemary, bay leaf, immortelle, sage, lavender, pomegranate, wormwood and chamomile. It can be drunk as an apéritif with dried or fresh figs and sugared almonds or as a digestif. The cult of wine is as old as Man in this area and it has accompanied him through ali of thè occasions and eve.nts in fife from birth to death. In Dubrovnik's gastronomie offer wine is represented by thè very high quality domestic wines of thè Peljesac, Korcula and Konavle wine regions. Some of these wines are known around thè world, such as thè red wines Pla- vac mali, Postup and Dingac, or even thè fine aromatic white wines of Posip, Rukatac, Marastina, and above ali, Konavle Malvazija from thè restored thousand-year old grape sort of that name.